The “People of the Tides” were divided into two distinct moieties (descent groups or “sides”), the Raven/Crows and the Eagle/Wolfs, that were divided into numerous clans subdivided into lineages or house groups with heraldic crests. Compared by some anthropologists to the Vikings, these seafaring people, credited with the introduction of the totem pole and bentwood box, traveled the oceans in large dugout canoes made from a single red cedar tree to accommodate as many as 60 paddlers. 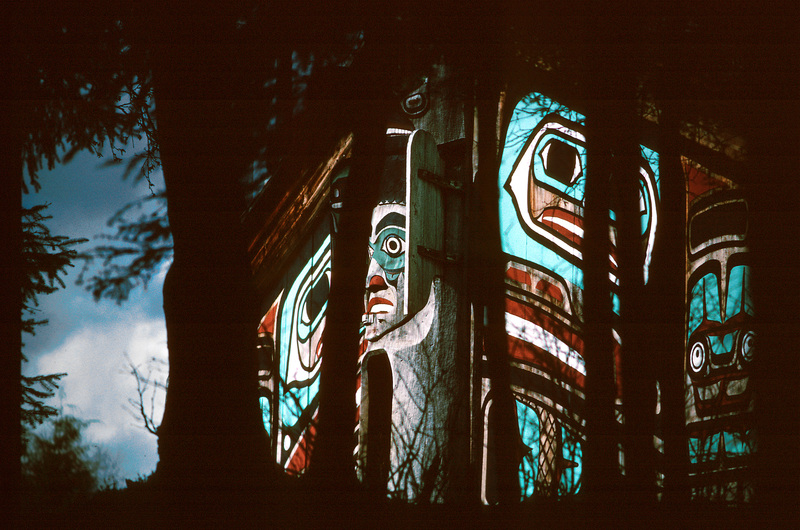 Named for their Skeena River transportation artery, these seafaring people lived with their extended family in cedar longhouses made with house posts and panels, developed the Chilkat weaving technique for clothing and decorations, and were divided in four phratries (instead of the dual moieties of Tlingit and Haida), Eagle & Raven and Killer Whale & Wolf clans. Complex matrilineal, family-focused clan systems where arranged marriages were conducted to ensure clan legacies, and doting grandparents and maternal uncles largely fulfilled the father’s roles of caretaker, teacher and disciplinarian (as compared to the father’s more generous, playful relationship). Hunter-gatherer culture where they lived off both the ocean (fish, seals, sea otters, shellfish, sea plants) and the forest (deer, bear, mountain goats, rabbit, beaver), with five species of the artfully-caught, deeply-smoked salmon comprising the main nutritional resource, while the multi-purpose cedar tree provided everything from dugout fishing/traveling canoes and storage boxes to totem poles and textile components for ceremonial regalia. A heavily-stratified society (wealthy, commoners and slaves) that lacked a centralized government system, preferring each household and/or village to govern their own by an elder male (and occasionally female) house master with such modern concepts as intellectual property. A rich oratory tradition from languages using complex grammar and sound systems virtually unheard in any other spoken language and an intricate array of art, including the Chilkat weaving technique that creates bilaterally symmetrical patterns. Significant spiritual beliefs founded in animism (most of their mythology is based on animals like the raven) and shamanism (healer, weather-influencer, hunting-blesser, precognate, witchcraft fighter), with a strong belief in charity and spiritual and physical cleanliness/purification culminating in both the afterlife and reincarnation. Enormous, meticulously-crafted cedar totem poles that served a variety of artistic and historical purposes (but none religious), of which Ketchikan has the world’s largest collection of standing poles. Potlatches, extravagant multi-day feasts that included feasting, singing, speeches, dancing and gift-giving, for significant life events and debt settlement. Great location - only one block from historic downtown Ketchikan!